The planetary nebula Sharpless 2-71, as imaged by the Gemini Multi-Object Spectrograph on Gemini North in Hawaii. The long-assumed central star is the brightest star near the center, but some astronomers wonder if the dimmer and bluer star (just to the right and down a bit) might be the parent of this beautiful object. A telescope in Hawaii has captured a spectacular new view on a distant nebula, revealing a glowing swirl of gas that is at the center of an unsolved mystery surrounding the nebula's birth. 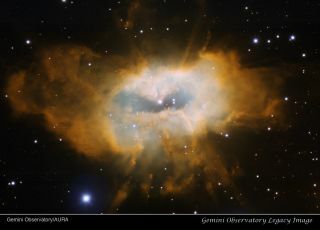 The photo from the Gemini North telescope in Hawaii shows the complex planetary nebula Sharpless 2-71, which is located about 3,260 light-years from Earth in the constellation Aquila (The Eagle). Planetary nebulas form when a star like our sun exhausts its hydrogen fuel. The star's outer layers expand and cool, creating a huge envelope of dust and gas. Radiation flowing from the dying star ionizes this envelope, causing it to glow. Despite their name, planetary nebulas have nothing to do with planets. Rather, the term refers to their superficial resemblance to giant planets, when observed through early telescopes. New observations have suggested that a dimmer, bluer star — visible just to the right and down from the bright central star — might actually be the nebula's "birth parent," researchers said. The brighter central star — which is actually part of a binary system — doesn’t appear to radiate enough high-energy ultraviolet light to account for the nebula's intense glow, the reasoning goes, whereas the bluer star likely does. "At the assumed distance to the nebula, the faint star has about the right brightness to be the fading remnant of the nebula’s progenitor star," said David Frew, of Macquarie University in Sydney, Australia, in a statement. Frew is part of a team of researchers studying the dim blue star to better understand its nature. On the other hand, researchers said, the central star's binary nature would help explain the nebula’s asymmetrical shape. It's not yet known if the central star's unseen companion is hot enough to cause the nebula's bright glow, or if the bluer star is part of a binary system. It's possible, Frew added, that the central binary and the dimmer star could all have played a role in the nebula's evolution. "So there could be at least three stars in this system," he said. The strange and beautiful Sh2-71 has already attracted a fair bit of scientific attention, but more work needs to be done before researchers get a good handle on the mysterious object's history. "The chaotic morphology of Sh2-71 implies that very complex processes have been involved in its formation," said Luis Miranda of Spain’s Instituto de Astrofísica de Andalucía, who has studied the planetary nebula extensively.